Utagawa Yoshitaki (ca 1841 - 1899) Onoe Tamizo II as Shozo from the play Fukuiri Takarano Irifune, c1871. Chuban. 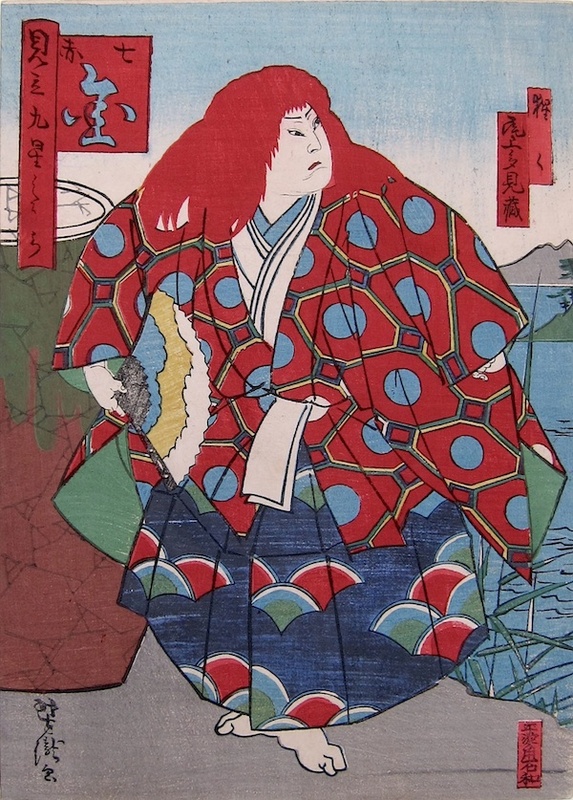 A notably overweight kabuki actor, Onoe Tamizo II was nevertheless a highly skilled and hugely popular performer, famed for his quick-change roles. In this print he is performing the famous lion dance with red wig. Although (or perhaps because) the print is on the smaller chuban size, Tamizo seems to burst out of it, not merely by his bulk but because of the astonishing colours of the print and the beautiful rhythm of circles and fans that decorate his costume. This is a fine and commanding character study by Yoshitaki - the last of the great Osaka printmakers. Another portrait of this great character, by Hirosada, can be seen here. Excellent colour and condition, retains Japanese album backing paper, trimmed to image.